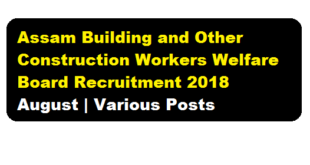 According to the latest Assam Building and Other Construction Workers Welfare Board Recruitment 2018, Applications in Standard Form are invited from Indian Citizens for Walk-in-Interview at Assam Building and Other Construction Workers' Welfare Board, for engagement in the positions and places mentioned herein below. The engagement is purely temporary and on Contractual Basis initially for maximum eleven months. The place of engagement is as shown at column 5 below or any other office as decided by the authority. 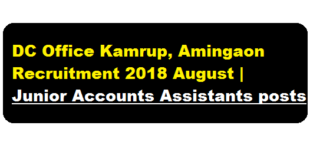 According to the latest DC Office Kamrup, Amingaon Recruitment 2018 August Applications in Standard Form as prescribed in the part-IX of the Assam Gazetted stating full particulars along with self attested copies of necessary certificates of educational qualification and other testimonials are invited from the intending candidates for filling up of the 6 nos of Junior Accounts Assistants posts lying vacant in the office of the Treasury Establishment at Kamrup District.We have discussed about this recruitment in the following section. 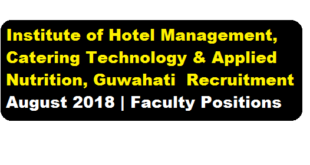 The Institute of Hotel Management, Catering Technology and Applied Nutrition, Guwahati is sponsored by the Ministry of Tourism, Government of India. The Institute invites application for Part-time faculty Visiting faculty (4 Nos.) 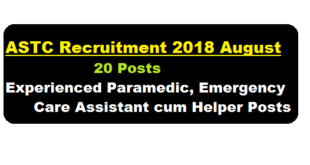 on per hour pay basis in a recent recruitment published on August 2018 Below we have mentioned full details of the recruitment. 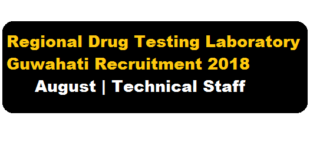 According to latest RDTL Guwahati Recruitment 2018, Director, Regional Drugs Testing Laboratory (RDTL), Guwahati invites applications from eligible candidates for the following contractual posts to be engaged at the National Tobacco Testing Laboratories, Guwahati within 15 (fifteen) days of the publication of this advertisement. 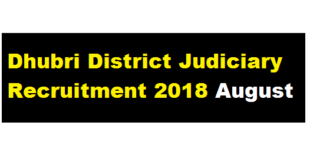 According to the Latest Dhubri District Judiciary Recruitment 2018 August , Application in standard form are invited from the citizens of India, as defined under Articles 5 & 6 of the constitution of India, having registration of Employment Exchange in Assam for filling up the Peon posts under the establishment of the Chief Judicial Magistrate, Dhubri. 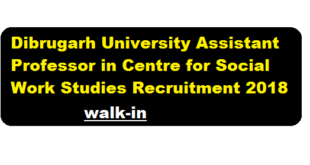 At AssamCareer.org We have discussed in details about this recruitment. Organization : O/o Deputy Commissioner, Morigaon. 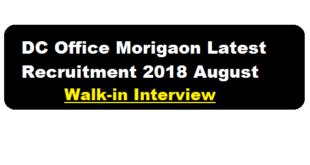 Office of the Deputy Commissioner, Morigaon has published a recruitment notification in the month of August 2018 for filling up Field Officer vacancies. Therefore Eligible & intending candidates are invited to appear in Walk-in Interview on 4th September,2018 at 11:00 AM in the Conference Hall of Deputy Commissioner's Office, Morigaon for recruitment to the post of Field Officer (Disaster Management) on contractual basis to be posted at Mikirbheta Revenue Circle of Morigaon District. 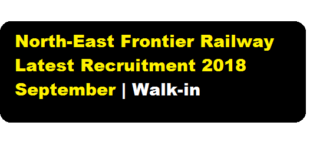 North-East Frontier Railway Latest Recruitment 2018 September | Walk-in for Medical Practitioner Posts :- North-East Frontier Railway has issued a recruitment notification in the month of August 2018 for Medical Practitioner Posts in Contract basis at Lumding Division. 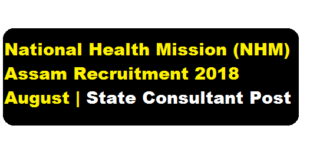 National Health Mission Assam has published a recruitment notification for the month of September 2018 for filling up State Consultant positions. According to the latest NHM Assam Recruitment 2018 August, Online applications are invited from the candidates willing to work in mission mode with challenging tasks for engagement on contractual basis for the State Consultant positions under National Health Mission (NHM), Assam. Candidates have to apply online in the NHM, Assam website: https://nhm.assam.gov.in. According to the latest ASTC Recruitment 2018 August , A Walk in Interview in the Office of the Managing Director, Assam State Transport Corporation, Paribahan Bhawan, Paltanbazar, Guwahati-8 will be held only amongst the applicant candidates found suitable for the under mentioned posts on and after secrutiny of their updated bio data required to be submitted on or before 30.08.2018 to the undersigned.